I added them. :) I like them and one of the things I like to do is add those beans to my salads. Once doing that I don't need any dressing. Very tasty and a nice easy way to get servings of beans in. Here are some more crock pot bean recipes. I like to switch them out. * FUN FACT: Cilantro stems still have the same amount of flavor as the leaf portion, so because the pressure cooker will be cooking them down to be really soft, you can use them instead and save the leaves for other recipes! Yes! That sounds so awesome! Yummy! For this slow cooked black beans (crock pot), I put chopped up onions and garlic and added them with the beans, then added cumin, chili powder, when finished cooking I added Braggs Aminos, when I am ready to eat a bowl I put nutritional yeast in it. They turned out really well. Thank you CG! Oh, the beans sound so gooood! What seasonings do you use? Can I come over? Glad to hear it was just nerves. That can be really scary. I hope you are feeling better. Thank you! I was in the waiting room while my SIL was getting surgery, and she isn't doing too well. I started to have chest pain, and they admitted me for observation. It ended up being my nerves, but I do have heart problems and a very rapid heart beat. But doing much better! Oh man sorry to hear about you going to the hospital. Did they find out what was causing them? Didn't do so well this week, but still stuck with it. I was in the hospital for chest pain. I got a little refreshed reading the blog Mamma Told Me. I really enjoy the pictures and getting a little bit more renewed. Will at least finish the challenge and I enjoy so much what the leader posts. Awesome! Happy Saturday all! I lost 3 pounds of what I had gained. It feels really good. I ate a regular donut, and I actually wanted an apple! The donut didn't make me feel as good as the apple. lol Who knew? Thank you for the info, Earnie! Love it! Sounds really good. I am going to look for the Greek Za'atar tomorrow at the store. That would be so awesome about posting in the challenge. You give such wonderful ideas! And a blog with pictures! Wow! For seasonings, I used S & P, and Greek Za'atar (roasted wheat, roasted thyme, ground sumac, sesame seeds & salt). I haven't been staying with the challenge lately so starting today, I will be trying to get back to posting a blog daily as that seems to keep me focused. I hope to post my meals and photos. I'm sorry about your friend Earnie, but that is awesome that you see your friend. Your lentil soup sounds great! Do you season it? Will have to get to the grocery too, to pick up some fruits and veggies. Probably won't make it until tomorrow. I didn't do so great on the challenge yesterday, but working on it! Slow but sure. Going to make a smoothie now and post it on challenge, which is the link right below this one. Happy Friday! I just made the 50 mile trip to a larger town that had better grocery stores and picked up some staples and fresh vegetables and fruit. I am set for the week. Actually had to go visit a friend who had a stroke and is in rehab there. So made the side trip to get some groceries. I made a pot of lentil, carrot & onion soup in te crock pot so am good for a couple of days. I live in a gated community so don't have kids come to the house on Halloween. Not a favorite holiday for me. Thanks Girl! Wow! You have wonderful willpower and control, even in your dreams! I followed the Challenge pretty good yesterday, but last night the Starburst Candy Monster took over me. I didn't do too bad, just glad they aren't on the table anymore. lol I could have gone in a full blown binge, but I just kept thinking how I want to get my sugar under control, and hypertension and high cholesterol. I slept all through the night. And, I didn't even dream of food! Let us know how the vegan donut was. Sounds great! And that's so awesome about not eating meat. Way to go! I'm not quite there with being vegan, but I am learning so much more about ETL this time around, because this challenge breaks things down, and I totally love it! I may be a turtle, but I can already feel a change in my body. Thank you for the great tips! Will definitely watch the blogs and youtube when I get a chance. And thank you for being a great inspiration! Woo Hoo! We can do it and we ARE! A chocolate bath! That is good. In my dream I just ate once piece. It's good to know that even in my dreams I'm having some willpower. I was over at my mom's house on Monday night and my dad has all this Halloween candies. I did catch myself. He has them on the coffee table and I was talking to my mom and unconsciously picking up one of them to eat. Then I realized I picked one up. I was dropped it like it was it was going to bite me or something. It's just one of those things where I would have mindlessly ate it. I'm happy I caught myself. Tomorrow I do get to have a vegan donut for the first time. This is going to be my first vegan junk food. I haven't had anything like that in 60 days (tomorrow will be 60 days of being a Nutritarian). In a way I'm using this as a test. To see how I will react to it emotionally and physically. For ideas I've found lots of little ideas to do. One of them is I want to make a curry carrot soup. I found lots of idea from YouTube channels and Nutritarian Blogs. I haven't had animal products in 59 days. I do miss some of them. I use to have cheese and yogurt daily, so that was a big change. Last night I made the Vegan Taco soup and wish it had meat in it. I do think if I added in mockmeat or TVP it would change that up. Mainly for texture. Perhaps just adding rice to it? Is it difficult to be around a meat eater? 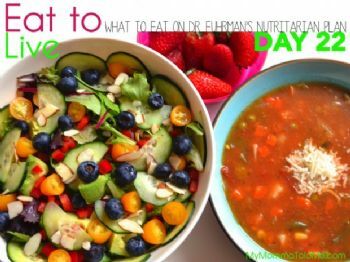 By following Fuhrman's diet, you could still have 4 oz of meat twice a week. For me I opted to go the vegan route. I have to say I've learned a lot about substituting things that recipes call for. At first I'd have to look them up but now I've done it so many times it's almost second nature for me. Love it Charming Girl! lol I dream all the time about food, especially chocolate in a chocolate bath. I ended up gaining a couple of extra pounds since losing the 15, but hopefully I am back on track with this challenge. You are doing so awesome! Way to go on Day 1! I am working on getting ideas again. I found my old books ETL and Eat for Health. Some good ideas. I just have to sit down and look at them again. I'm still wanting things like sausage, my husband is a real meat eater, but working on it slowly. This is such a great idea. Thank you for some great ideas! I was looking at some of the links and found wonderful ideas on the last challenge from you! Awesome! Oh man, when it's in the dreams. I think that's the first time I had a dream of food. It wasn't the main part of the dream, just a side part but I there was a part of me in there telling myself, just one piece. I agree Earnie, we can all support eat other. Good to have you! That's so great! Yay! I am really excited. It really makes me accountable and you all are awesome! I didn't do perfect yesterday, but I really focused on more fruit, and I actually think I lost a pound already! Wow! Way to go Mauitn and Charming Girl! And, yes Charming Girl, I am actually starting to feel better and so glad to eating healthier even with Halloween approaching. lol I love to eat candy like a little kid on Halloween, but I am focusing on more fruit. I'll join you and that makes three of us to share and support. I'm starting today. Woohoo VeggiePat! I will join you. Isn't it amazing how good it makes us feel when eating so good. I hope I posted in the right spot. I am starting slow, but really happy with my salad with avocado and nuts. Really like easing into it. I feel skinnier already! Sorry, I didn't read all of the details before posting. I put in my last two days. The challenge points for counted up for me. Oh good! I'm planning on making butternut squash soup. I need to make more veggie broth. I had a few sick days but I'm doing better and I'm on track. I've updated all of week 3 and some of week 4 (to the present day). I like that ,CHARMING_GIRL, how you put the 2nd week under the 1st week so everyone can just do that. just make sure you get everything marked up to this point. ETA: I updated my tracking post. How about our 2nd week's food. I've just been keeping notes, but I'm not sure where to post? Above your weeks' summary? Hmmm... Interesting. It sounds very much like the original dressing, except for the white wine vinegar... but I guess that makes a big difference in taste. I'll have to get some. I made the Orange Sesame Dressing/Dip by mistake. I thought it was the same recipe. Well, it's okay, and I liked it but I'm not a HUGE fan of it. I didn't have Blood Orange Vinegar so I used my pomegranate balsamic vinegar. This makes a lot and it says it's for 4 servings of 127 calories. I will not be using that much because it's just too much but it was different and I will use it for tomorrow's salad. After this dressing I will make the Blueberry Pomegranate dressing. Then go to the Orange Cashew dressing you posted. Sounds good to me. Please let me know if the orange flavor is fairly significant. You know, hemp hearts are good too -- they add to the creaminess, I think. I don't have sesame seeds but I have flax and chia. Maybe I'll substitute one of those for the sesame seeds. Put all ingredients into a food processor or high-powered blender. Blend until smooth. Top salad with dressing. Enjoy! I'm thinking next time I should add some ground flaxseed. Just adjust some of her ingredient, like sometimes she puts in olive oil, I don't use those. Sorry to get a late start. Been on the road. I am very excited about this challenge. I have been wanting to start eating healthier with Eat to Live. This challenge is a good way to begin. Can someone give me Dr. Ruby's website? Thanks. JAZZEJR, thanks for share. I book marked it. It's amazing at how much of the recommended things to do, I already do. I've invested in mason canning jars (many sizes), my containers, and to have salads made and ready 4 days at a time. If I have two days of the week as my salad chopping days it gets me through the week. As for roasting veggies. I love roasted veggies. One of my all time favorites is golden beets. DS9KIE, Wonderful. Isn't it great to make your own broth? I did that for the first time last year and I was so excited and proud of myself. Now I just keep saving them up. The weather is changing and soon it's going to be soup season. I love making soups now. I feel like I'm really doing something productive and good for myself. Also, I first learned about Dr. Ruby when I was watching my Save the Kales station on my Roku. Then I saw a recipe from Dr. Ruby and I have been following her since. I like her recipes and she gives some great ideas. I like that Jaime K recipes from Save the Kales. She is a vegan and makes all kinds of neat things. It was her Kale Chips recipes that totally sparked me into cooking more. Now I love Kale Chips! Maybe you guys have seen this page before. I found it quite helpful for ideas re food prep for the week. Thank you Sooo much, Charming_Girl, for introducing me to Dr. Ruby. I had no idea to whom you were referring, so I googled "Dr. Ruby." Great website--love the cooking videos! JAZZEJR, it was a good smoothie. I've heard that from Dr. Fuhrman, I think from a youtube video. I can't remember which one because I've watched a lot of them. When I'm making salads I always keep all the ends, stems, and parts I don't use and freeze them. It's because I'm going to use them when I make a soup broth. I've heard Dr Fuhrman and Dr. Ruby say to keep the stems and put them in smoothies. I add some stems to my smoothies. Dr. Ruby also said to keep all the watermelon rinds. She explained that they have even more nutrients in them, so after cutting the watermelon, juice the rinds. I haven't done it myself but I'm curious to what it will taste like and what to mix it with. I know what you mean about the salads looking way too big. Today I made the Kale Avocado and apple salad. It's 4 servings and just one serving is huge. My biggest struggle with following the recommended servings, is I struggle to eat them all. With my salad I added a few more veggies (carrots, mushrooms, and spinach). Hmmmm. That smoothie sounds delish. I heard Dr. Fuhrman explain something I hadn't heard before -- that if we eat some steamed greens, we should have a cruciferous salad at the same meal to get the benefit of the same level of anti-oxidants. So tonite for dinner, I had some steamed turnips and kale mixed + a chopped raw salad of purple kale, green & purple cabbages, romaine, green & red bell peppers, white onion & red onion, carrots & cucumbers. Looked like way too much to eat, but it was so tasty, I ate it all. Well, I feel that I get it off to a great start. I went shopping and stocked up on a bunch of green leafy vegetables, I have plenty of G-Bombs to eat for every day, and I have made a weekly menu for the different meals that I'm tracking on my excel sheet. I'm making sure I have all the recommended groupings daily. For breakfast I've had a green smoothie (looks dark purple): 1.5 cups of blueberries, 2 kiwis, 2 tbs of lemon juice, and 2 cups of beet greens. I had some beet greens left over and wanted to use them up. JAZZEJR, Thanks for posting the chart and the link. The Chart below reduced way too much to be seen, but I found it at the link below. She offered it as background for your computer. It's serving as an easy reminder for me. I'm all pumped up. I did a quick review of Eat to Live and watched Dr. Fuhrman's videos until late into the night. My fridge is stocked with greens, mushrooms, carrots, cashews, dates, nuts, etc. Soup is made, and I'm good to go! WooHoo! God bless us all!!! I'm so grateful for this challenge. I have been eating very badly and trying to get back to the Eat2Live program with very little motivation. So this challenge is just what I need to get back on board and 4 weeks is the perfect amount of time to turn this into a habit. Tomorrow! I'm scanning the book again. Good time of the year with so much produce available. Very excited to start this! This might be a little off topic, but JAZZEJR I love your quotes in your signature field, especially the Kate Moss one. Daily Reminder: Things never go exactly as planned...so find another way. Be flexible. And always remember to pray and ask God for wisdom and guidance. I'm in -- will make me hurry up and empty that freezer that I've been trying to for a month. B - 30......... B - 30.........etc.............etc. L - 60......... L - 50..........etc.............etc. D- 50......... D - 70.........etc.............etc. Got some half in half I am weaning off of and then can be 100% even on our 25th wedding anniversary as I am making a picnic lunch. This is just what I needed and it parallels with my BLC challenge. I'm really excited. Sorry about the timing. I am 83 and may need another reminder, on Sunday, that I should start the next day. It all depends on me!! Just try your best at the challenge...I'm also using up food in the kitchen. I'm not always eating pound of salads but I just try to eat healthier than before. this is the chat page.. This challenge is 3 to 4 weeks sooner than I would be at my best to do since I am using up some long-stored items in my freezer before my planned return to this eating plan (but not strictly followed). AND I only am able to go for groceries on a Tuesday and unless lost in the freezer, no mushrooms before then. Liver on menu tonight. 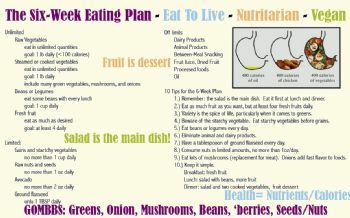 On the Eat to live challenge page, sign up by cut and paste the chart and I will see your name. This will be a 4 week challenge, you chose whatever you eat under the “Eat a” list and then add it to the chart below, add the number for each week, you should end up with 4 weeks. Cut and past the chart and keep adding by editing for the week by adding what you do from the list.